The street artists of Melbourne are all over the pop cultural zeitgeist like a puffy shirt. 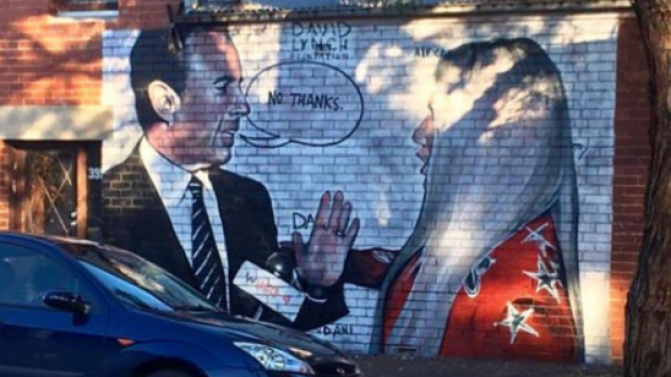 Mere days after a video of LOL king Jerry Seinfeld hug-dissing Kesha went viral AF, a mural dedicated to the turbo-cringeworthy burn of a celebrity encounter has appeared in North Fitzroy. The culprit is noneother than Lushsux, whom you may remember from such other excellent pieces of street art as ‘RIP Taylor Swift’ and Kanye-in-a-straight-jacket. And the best part? Apparently the masterpiece became a meme before the artist himself was even able to upload a pic.